You were asked to gain 15-35 lbs. over the course of 9 months. That is a significant amount of weight to lose. Women have a much higher blood volume during pregnancy. And that does not vanish overnight. Within the first 4-6 weeks your postnatal body is considered “normal” in the fact that all systems are back to normal. But you are left with loose muscles, extra fat, fluid retention for breastfeeding and sometimes some cellulite that did not reside on your thighs prior to getting pregnant. 18-20 pounds usually goes within the first 4-6 weeks (based on a 30 pound weight gain). The 18-20 pounds comes from: baby, amniotic fluid, placenta, blood volume, breast tissue, fat storage urination and the uterus involution. With all of this in mind, notice how hard your body is working in the first few weeks postpartum, it is a super delicate time for their body! ...expect your body to be back at it's pre-pregnany weight around 6 months Postpartum. Anything before that is simply unrealistic. Celebrated turning 36 on the beach! I slipped away for a 7 Day Disney Cruise to San Juan. 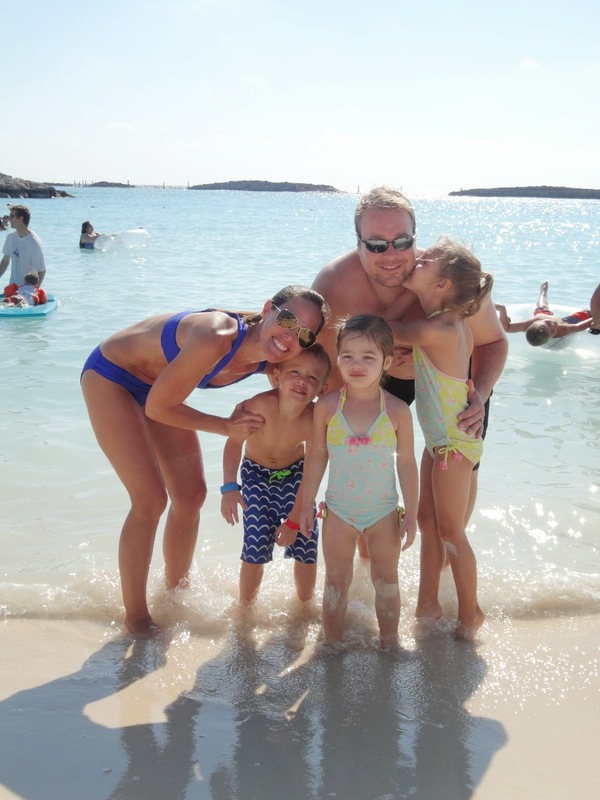 Not only was it one of the best family vacations, but I came back feeling like I took a vacation! Turning 36 on a beach in 90 degrees, can't complain. My parents even took the kids back to the ship after 6 hours of beach and I relaxed without worrying about a 6, 4 and 3 year old getting in the water (even though the water was freezing it sure doesn't stop the kids!) Ahhhhhhh. 1) How to keep the vacation weight gain to a minimum. 2) How to detox after the vacation is over. Have you ever done that? Worked hard to to feel and look good on vacation and then tossed out the healthy rules for vacation? Me too. And I think it is ok. Keep reading. One day everybody will look at the camera! While thinking of the Vacation Rules I realized I did not want to provide your common "Stay Healthy while on Vacation" type Blog Post. I wanted to toss out the rules that don't let you completely relax on vacation. You are a mom, you need vacation. You need a day without rules. You need a day without being the family brain. So while this is not the most scientific - it is a vacation plan any mom can follow and not come back feeling like they ate bricks! Exercise - not necessarily everyday, but enough to keep the bloating away and keep your energy going. Skip the Buffet - if you happen to be on a cruise like me this one can be a hard one. Allow yourself one trip to the buffet. You can have dessert - heck yeah! You know those frozen ice cream/yogurt machines with a cone? For just a few hundred calories you can satisfy your sweet tooth and your kids begging for ice cream. Hydrate - Water will keep you hydrated in the sun, deplete bloating and help keep you full. Alcohol - do I promote drinking? Nah. But sometimes a beer or a glass of wine (or a few) are your way of winding down and vacationing. And keep in mind those fancy frozen drinks are about 500 calories a pop! Keep the BLT's to a minimum - that's Bites, Licks and Tastes. Eating Twizzlers on the beach? Sampling the leftover mac and cheese on your kids plate? Grabbing some Goldfish while you toss some to the kids? Following lunch with a few harmless Hershey Kisses? I hate to say it, but these add up to an easy 300 calories, which is equal to about a 20-30 minute workout. DON'T DO IT! Stick to breakfast, fruit for a snack, lunch, fruit for a snack and dinner. Get back on Track - did you indulge heavily one day? Or give into every craving? Ok, it's in the past. Get back on track with good breakfast - fruit and oatmeal or fruit and yogurt. And be a little more cautious at lunch and dinner. For me I came back from vacation bloated and hungry every 2 hours. So I did the 3 Day Hunger Reset - 2 days after I got back cause I just wasn't ready to commit:) Day 1 was hard! Day 2 I started to notice my cravings were going away. And Day 3 I felt like I could put myself on the scale without being mad at myself. And Day 4/5 I felt like me again! Follow the 3 Day Hunger Reset! It's not about a crash diet or extreme detox, it's literally the most natural way to reset your Hunger Cycle. Think of it this way. You eat (and drink) more often on a vacation. Your body gets used to this new habit. Your body expects this to keep happening. So we need to get your body out of this habit. All the details are here. It's about getting rid of refined carbohydrates for 3 days, letting your body deplete some glucose storage, and resetting your hunger cycle. Pair the Vacation Detox with a 10 Day Workout Challenge and your body will be back on track in no time! Nip it in the bud, before your vacation habits become permanent habits. Healthy eating tips, healthy snacks for kids, healthy meals for kids and nutrition or kids. It's all right here in this 6 page pdf to download. Kids...just how are we supposed to feed them? We want them to grow up healthy and strong in all aspects of life. As moms we all have the same goal. And believe it or not -- supporting their nutritional health is a lot easier than you think. 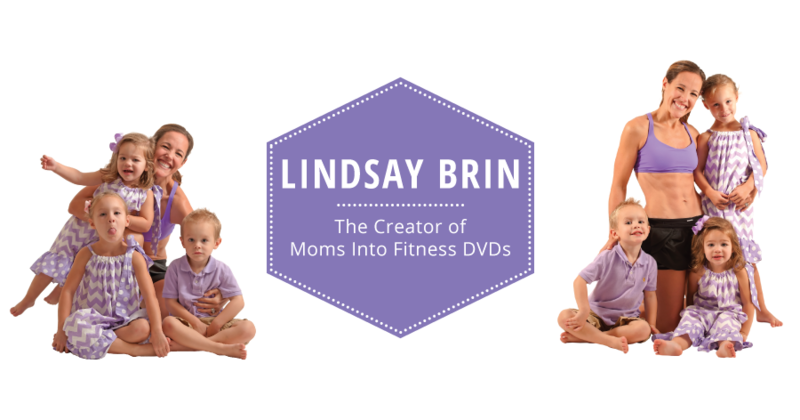 In this video I am going to hit the Top 5 Things every Mom Needs to know about Kid's Nutrition. How to make a Healthy Plate while still providing your kids with their favorites like Mac n' Cheese and Pizza. Subscribe to my YouTube Channel for Free Workouts every week and more Kitchen Hacks! Kitchen Hacks like the Top 10 Diet Mistakes Moms Make. See more Kitchen Hacks and Mom Diet Nutrition HERE. 1. You throw in the towel after 3 days of dieting. The first 3 days are the hardest! You need to give your body time to deplete some fat storage and stop the cravings. The best way to do this is—eliminate all added sugars for the next 3 days, these are refined carbohydrates like sugary cereal, candy, junk food, and starchy foods like white rice. By eliminating all added sugars from your diet for 3 days you are giving the body time to deplete some glucose stores while also breaking the hunger cycle. The cravings will stop after 3 days and you will be motivated to continue! Download the pdf -- How To Do the 3 Day Hunger Reset. 2. You have the kids ready to go, but forget about you! It’s 6am and the kid’s lunches and snacks are ready for school, but you do not prepare your own. So then you reach for the most convenient item to satisfy your hunger. Prepare ahead of time so you have something healthy and convenient! 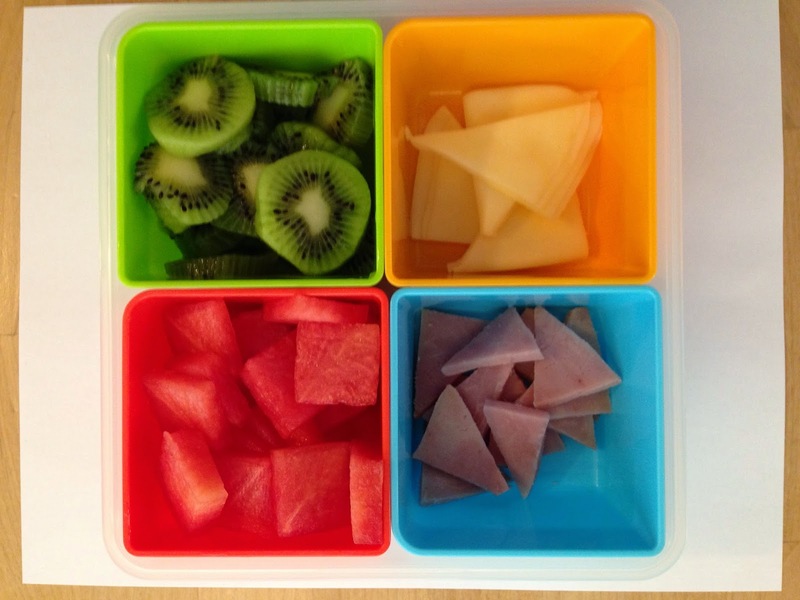 Portion out your snacks and even your lunch so they are right there when the time comes. 3. BLT’s. I am talking about the Bites, the Licks and the Tastes. You take your kids for a walk in the stroller – your grab a handful of Goldfish to keep them happy – you pop a handful in your mouth. You are clearing the dishes – your daughter didn’t eat all of her spaghetti – you take the last 4 bites. Those Hershey kisses in the candy dish – you tackle your sweet tooth after lunch. Don’t do it! It adds up easily and can take 30-60 minutes of exercise to work that off. Eat within your perimeter and no bites, licks and tastes in between your meals and snack time. 4. You go to the Store with the Kids. You know that bakery cookie the kids get for free at the store only last for 10 minutes! Then you spend the remaining 45 minutes rushing through so you don’t have to battle the kids sitting in the grocery cart and/or not throwing in every bag of chips they want. Go at it alone, even if it means you get up early one day of the week or spend your babysitting time going to the store. You can take the time to educate yourself and you will come home with less temptations. 5. You commit to the Workout but you don’t commit to the Nutrition. It’s day 7 of your new workout routine and it is going well. But the scale isn’t budging. Ugh. 99% of the time the nutrition part is the hardest part to change when committing to a new routine. But do it – you will get there twice as fast! And it usually is the main reason the scale isn’t moving in the direction you would like to see! The easiest way to do this? Eat 20% less. Done. 6. You eat the right foods. But you eat too much of them. There are so many options out there, which is the “right” food? Most of the time you know which is the right or better food. Pick the apple over the cookie. Pick the grilled chicken over the fried. But is that enough? You really do need to know just how many calories you are consuming. So for 7 days food journal, that’s it and you won’t really need to do it again. And the good news – there are plenty of apps out there to help you with this! >>>>>Try My Fitness Pal or the Moms Into Fitness App....we will calculate how much you should eat to lose weight! 7. You don’t drink enough water. I know you all have heard this before so I am not going to harp on it. Drink water. Don’t drink too much soda. It helps flush fat and is one of the number one aids in weight loss! If you are pregnant or breastfeeding you need more – According to the Institute of Medicine you need 13 cups a day for Breastfeeding (16 cups total but 20% of water comes from foods), 10 cups if you are pregnant and 9 cups if you are female. 8. You forgot to turn off the Pregnancy or Breastfeeding Radar. Studies show that moms that don’t lose the weight in between having kids on average keep 10 pounds per baby. So 3 babies = 30 extra lbs. Turn off the pregnancy eating and get back to you in between having kids. And if you are like me – 3 kids in 3 years – you might have to modify that plan a bit! 9. You crash and burn at 9pm. Ahhhhh the kids are in bed, the dishes are done (maybe), the homework is behind you, you have some emails to catch up on. And maybe you never ate dinner. Do not let this time be when you fall off the bandwagon! Find some good After Dinner Treats, and ones without too many calories. Your best bets are: homemade hot chocolate, hot tea, lowfat chocolate milk, a hot bath, something other than the sleeve of Girl Scout Cookies or Chips and Salsa! If you need a little help in the nutrition department and how to prepare everything for the week in under 3 hours, check out the CookOnce eBook. Our Registered Dietitian put all the goods in it! Hot Darn...Spring is fast approaching! And with that comes vacations, swimsuits, tank tops, swimsuits, shorts, swimsuits. You get the picture. So I created a 10 Day Core Meltdown with all new videos - and they can all be done in 20 minutes or less! All the videos are on YouTube so they are super easy to follow. No signing up, no links, just do the videos. And we broke down the 10 Day Schedule on Pinterest. And make sure you follow our 3 Day Hunger Reset. Exercise alone is great, but getting your diet in check will help that scale drop! After pregnancy, your uterus shrinks about a finger width every day. In five to six weeks, it will return to pre-pregnancy size. That means in that time it will go from the size of a watermelon to the size of an orange. Pretty impressive, right? Your body is remarkably adaptable, and your recovery to pre-pregnancy hormone levels, uterus size, and so on is a postpartum miracle. Your core muscles are just as adaptable. But you have to use all 4 ab muscles to make them bounce back. You cannot expect them to bounce back unless you initiate the muscle fibers...by you guessed it...doing core exercises. During pregnancy your Tranverse Abdominis and Pelvic Floor support that baby. So wouldn't it be wise to work those muscles to get your stomach to go back to the way it was? ----Directly form Wikipedia Training the rectus abdominis muscles alone will not and can not give one a "flat" belly; this effect is achieved only through training the TVA. Using the transverse abdominis muscle is a big part of your postnatal abs. The TA is a thick layer of muscle that runs from hip to hip, wrapping around the torso from front to back. The muscle fibers of the TA run horizontally, similar to a corset or a weight belt. These muscles are your true core muscles, and strengthening them will give you power and tone your entire body. So we are going to get deeper and work you inner core. It is a wonderful workout for beginners and workout veterans. We include modifications for diastasis recti since we do not use the rectus abdominis. More about diastasis recti, how to exercise with diastasis recti and how to test diastasis recti click her for the What is Diastasis Recti 2 min video. 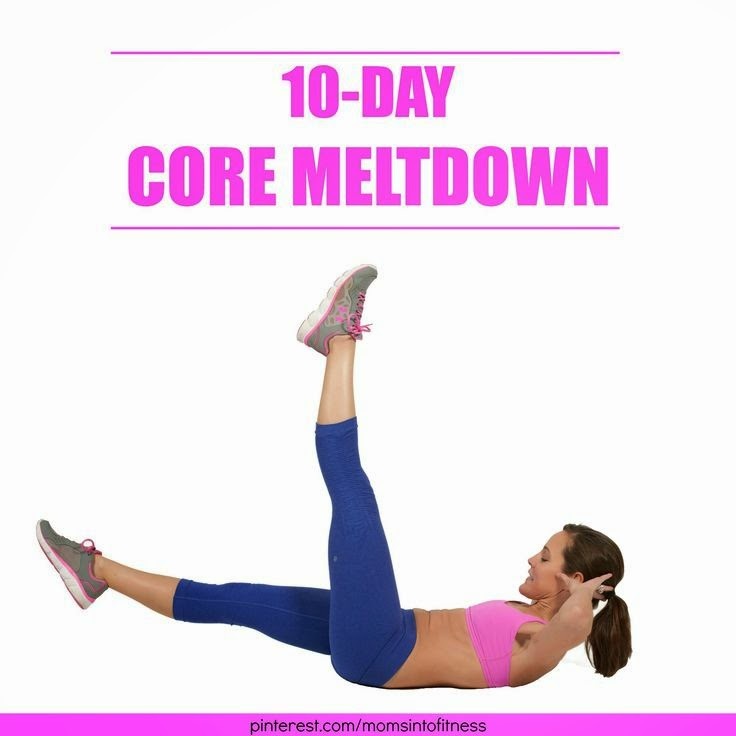 Use this free 8 min Postnatal Core Workout. 8 free postnatal exercises to get you going in your quest to get your body back! 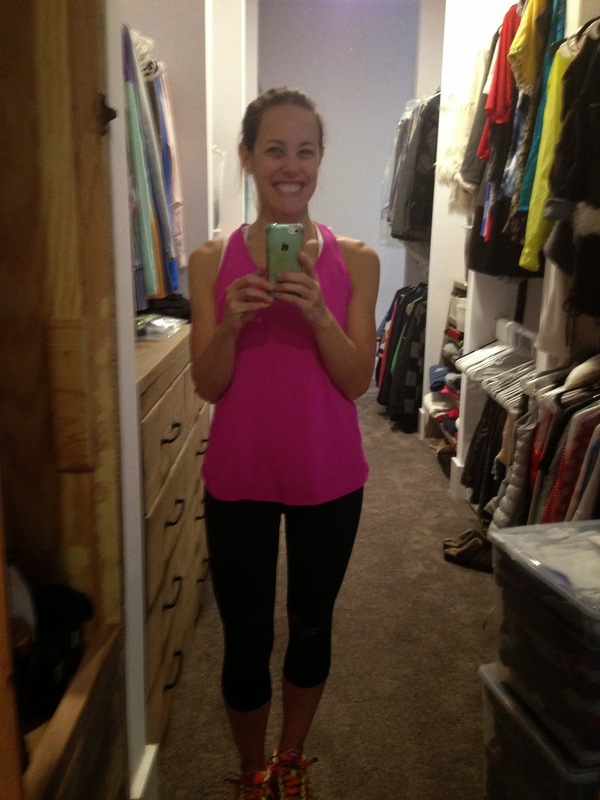 Get more Postnatal Workouts on my YouTube channel - just hit subscribe! You indulged. We all indulged. And you know what -- it is totally ok to indulge!! 1 day is not going to throw off your weight (scientific fact 3,500 calories = 1 lb). Maybe you ate 3,500+ calories yesterday (and burned about 1,500 by just being alive) and are feeling quite swollen. But let's get you back on track before 1 day of indulging turns into the month of December. You may need to follow the 3 Day Sugar Cleanse in Step 5, keep reading. Step 1 -- Maybe the most important step. Put on your workout clothes. Make the decision to workout. Even if it is only for 15 minutes! Step 2 -- Do a HIIT workout. High Intensity Interval Training. The kids are home and there is minimal time. Unmotivated? Refer to Step 1. Step 3 -- Hydrate! Hydrate! Hydrate! If you are like me you woke up a little swollen from all the salt intake yesterday. 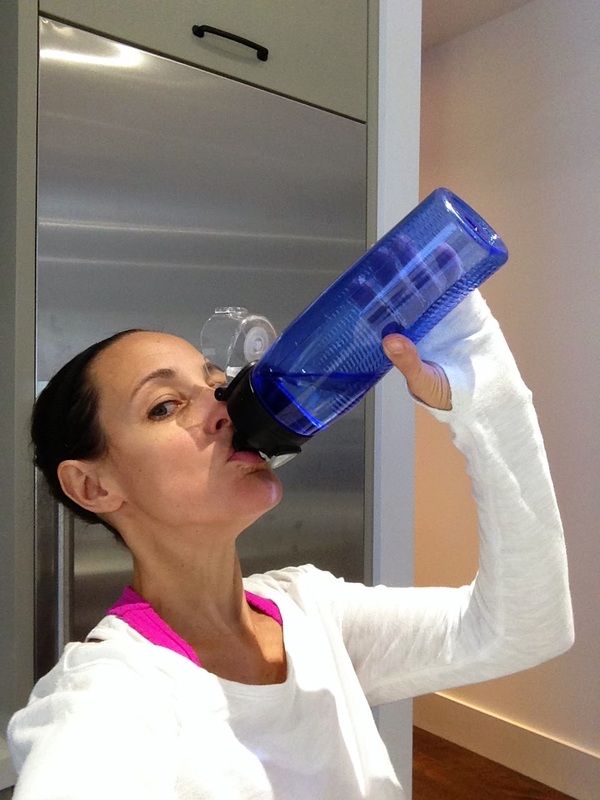 Get your systems back in order and help flush fat with water. Shoot for 8 cups, 10 cups if you followed Step 2, 12 cups if you are breastfeeding. Step 5 -- Do not pull your usual stunt...I will start my diet tomorrow. 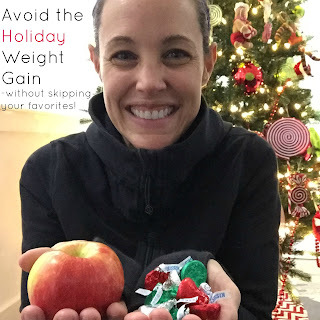 Enjoy some Holiday treats but do not go overboard. If you feel yourself falling fast into the Holiday sweets, do a quick All Natural 3 Day Sugar Cleanse, it will reset your Hunger Cycle. Here is what the hunger cycle looks like. You wake up in the morning feeling hungry but because you have to rush kids out the door and don’t have time to cook, you grab a sugary granola bar or down a quick bowl of sugary cereal. This makes you full in the moment, and meets your calorie needs but 2 hours later you are hungry. Why? When refined carbohydrates, or sugar, are digested the yare converted to glucose and quickly hit the blood stream giving you an immediate spike in blood sugar (or blood glucose) which boosts energy. Your body then releases insulin to move the glucose into cells to it can do its job. However what is not immediately used is then stored in the body. This all happens pretty quickly, sometimes within a 2 hour time period, leaving you feeling hungry. When we get hungry it is one way our body cries out for energy and because our bodies are efficient it craves the most readily available source of energy... sugar. Here is where the cycle begins again. Yeah, yeah, I have been MIA for the last 6 months. It started with taking off the summer - something I had been promising myself since my 6 year old was in the baby bjorn at 2 weeks old and I was making final edits to my first book. Standing to write most of the book because it was the only thing that soothes a 2 week old (how do they know you are not sitting? never figured that out). So I spent the summer with my kids and put the computer aside! Then we moved into the house we have been saving, designing and building for the last 4 years. Not realizing what it is like to move 3 kids and 3 kids stuff - holy tamales. I am glad it is our forever house! 6 strep throats, 2 stomach flu's, a babysitter that needed to concentrate on her Master's and not my little ones, the start of 1st grade, Halloween, my 10 year anniversary to my husband and a closet that is finally put together...well that brings me up to speed in November. My new favorite things are: my 6 year old can read to me and it's amazing, the new 18 quart Crock Pot that fits a turkey, Kids Gap constant online sales, my organized closet, my 3 year old that will now eat a vegetable (so it's only green beans but it's start), the early Christmas trampoline the grandparents got for the kids that tires them out--it works in my favor too, my 4 year old that loves to give hugs, my 6 year old that will go to bed 2/7 nights without a fight, my mom that loves scrapbooking (since I am still on Rylan's birth, he is 4), still love my minivan, snow and everything that has to do with kids playing in the snow, oven baked tacos I found on Pinterest, there are too many to list. But that's me and the last 6 months and all the love and laughter and stress. That said - Moms Into Fitness has some pretty exciting news. Coming this January!!! How do you measure your body for Weight Loss? So how do you measure yourself for Weight Loss? Click to learn more about How to measure yourself, or just watch the clip above! How to get your body back after C-Section! First and foremost, no exercise should be performed until you have your doctor's permission! Ok, so C-Sections are scary, but they aren't bad! For me I was in lala land trying to breastfeed my 1st baby in the recovery room…couldn't quite pull it together:) The pain was covered up by drugs - although the drugs spoke for themselves as I fell asleep mid-sentence constantly. But what happens afterwards - when it's time to get your body back? For my vaginal delivery gals - I have always envied you a bit. You are also left with a " a little mess", but pushing a baby out is an amazing feat! Our ab muscles are affected the same way - we are all pregnant the same way. Your recovery will be slightly different fromm c-sections, …so keep reading. Does a C-Section cut your muscles? A C-section is a surgical procedure so there will always be some scarring, but unlike what most women think, your doctor will not be cutting through muscle with the exception of the uterus. When a C-section is performed two sets of abdominal muscles are separated from one another but are NOT cut. A transverse (horizontal) cut—the so-called Bikini Cut C-Section—actually causes fewer complications. Since it is below your bikini line it will be far less noticeable than a longitudinal (vertical) incision. If you had a C-section some exercises could bother your incision site, so back off until you are ready and only do exercises you are completely comfortable doing. If you feel some discomfort try saying "hut" while doing the work. And/or support your abdominal area with a pillow for more comfort. Otherwise you should be able to exercise around 6 weeks when your doctor releases you. You will just need to start out a little slower than if you had a vaginal delivery. And you may feel numbness for a few months after your procedure. Why? Your nerves were cut and will take a bit to recover. A C-section is like having a cast on your arm. It will take longer to recover, but the good news is you can have the same end result as a vaginal delivery. As you read above, a bikini cut c-section does not cut through your muscles. The fascia is one of the 5 layers cut as your doctor goes in to get the baby. Fascia covers the muscles and acts as a sheathe to keep our waists compact. After birth your fascia will be back to 90% of its original strength within in 6 weeks, the other 10% will come back within a year. You cannot strengthen or tighten your fascia without surgery…so preventative measures are necessary...staying within the recommendedweight gain is a must! You will have to train your Pelvic Floor and Transverse Abdominis, both deep muscles of the core. Whether you have a vaginal delivery or a c-section the Pelvic Floor and the TA act as a sling to your baby. Which is why you need to train these specific muscles to get back the integrity and strength of your core before returning to traditional abdominal exercises. My Postnatal SlimDown DVD has all these core exercises. We start with Core 1 using only the inner core, then a progressive core series Core 2, Core 3, Core 4, Core 5 as your core builds strength. Also includes 10 minute toning and cardio workouts to fit your schedule (including Amy who does all the toning exercises modified for diastasis recti).